B U B B L E G A R M: 30 Weeks Pregnant.. CHIT CHAT! 30 Weeks Pregnant.. CHIT CHAT! The days are getting closer and I still feel like I have so much to do. The past week I have been going totally bananas with options for cot bedding. Yesterday, I picked up some fabric samples from 'Cloth House' thinking that I may perhaps design and make my own. But, to be honest I would rather find a gorgeous ready made one from the shops and save myself time. I showed you the fabric letters I picked up from Mamas & Papas a while back, and want to pick out the creamy colours for the bedding and have accents of brighter colours in the accessories. I also picked up this chicken shaped pillow from the same range (Made with love) at Mama's & Papa's, it's just so cute! Back to bedding, I really do like this quilt from Mama's & Papa's but it doesn't fit the Ikea cot that I want, I may buy the bigger option and cut it down, ahh so confused! My dad also said he might have one made for me in Turkey, so I'm just waiting for confirmation and then I have to REALLY decide. I started crocheting some flowers, I might make a pillow, or even a cot mobile, a headband or decorations for something else out of them. I love the little details in both of these photos, isn't the nappy stacker so cute! you look great! I love that top! You look very beautiful and happy. Also, love the top and all the adorable home made accents you have. Very cute and crafty! Aww, you look so healthy. When I had a bit less £ and my friends had a baby, I found loads of new (sealed) baby items in the local charity shop. They were in the window, so it was meant to be! I love the flowers, so cute. wow, having a baby seems like an exciting time! The best bit of advice I can give to a new mum is to invest in growbags! If only these were around 10 years ago when I had my first child. The website explains all about them. Love all the little bits you've picked up - such beautiful fabric. I think you'd find gorgeous bedding in the style you're looking for at Pottery Barn...if they don't ship to the UK, people are always selling NWT ones (unopened in their packages) on eBay. 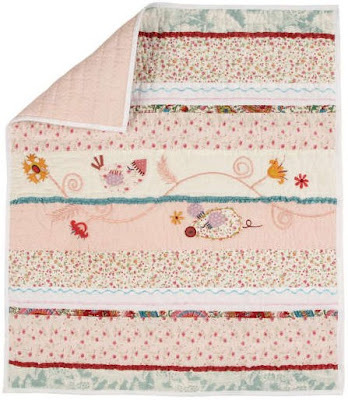 For local options: Mothercare also had lovely bedding - as does Jojo Maman et Bebe. Congratulations and hope you have a wonderful and fun future with your new addition to your family! You look so content and happy! I am so excited for you! Babies are a precious gift and deserve all the love in the world. Awww Mushi your bump is gorgeous! Enjoy, time flies and she will be here soon! I'd say don't buy a changing table, it's OK for the start, and Jamie actually loved his, but by 9 months ish, they outgrow it, and it's kinda a waste of space. Get one that has drawers or something underneath perhaps? Nappy stackers are a great idea, and a much prettier but practical way of storing nappies, I love ours. 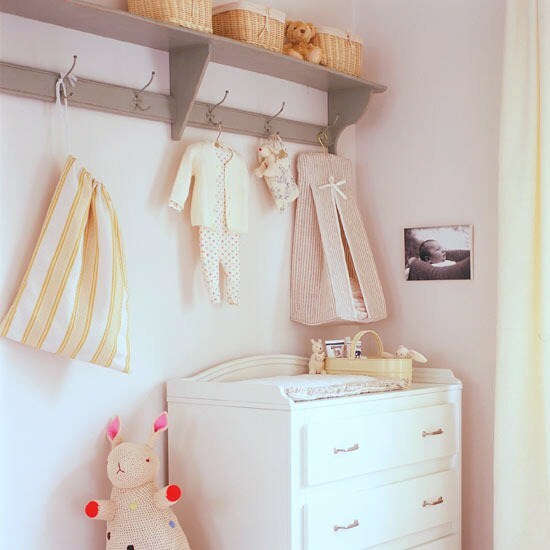 You'll want somewhere out of reach to store baby lotions and potions etc, so shelves with baskets are fab, and I love the second picture that has the hooks on, perfect space saving idea. Try and think to when the baby is older than 6/9 months, there are so many 'new baby' things that simply don't get used for long enough. 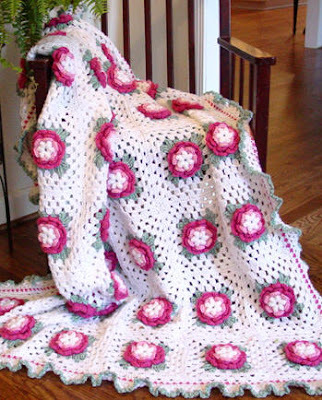 I love the idea of knitting the blanket...my nana knit me a blanket when I was a baby - she spent hours and hours on it and I still have it now (aged 22!). Unfortunately she died when I was 2 but I still sleep with the blanket under my bed sheet at night so she's always in my thoughts! It is so exciting when you are expecting a baby. There is so much to do and it is life changing if it is your first baby. Your nursery ideas are looking really nice and I look forward to seeing the finished room. It won't be long now and you will have your new little one. I love the crochet blanket you found. Visit http://www.babiestotoddler.com and http://www.babiestotoddler.com/baby-and-toddler-bedding/ for more baby ideas in bedding at affordable prices.